Ryder Cup betting tips and predictions for 2018. This years renewal comes from the Albatros Course of Le Golf National in Guyancourt, Paris, France from 28th – 30th September. Our expert Golf tipster Steve Palmer gives you his Ryder Cup predictions and best bets in his betting preview of the tournament. View and bet on his Ryder Cup tips to give you the best chance of beating the bookies. Before we get into the selections let’s look at some of the important factors we need to take into account when betting on the Ryder Cup. The Albatros Course of Le Golf National in Guyancourt, Paris, France is the stage for the 2018 Ryder Cup. The course is also host to the HNA Open de France and is widely regarded as one of the most impressive on the European Tour. The course features hard greens which requires the need for bump and run approach shots and it boasts an 18th hole which was voted the most difficult hole on the European Tour. Seven of the twelve European Team played in this years Open de France including the eventual winner Alex Noren. The Ryder Cup is made up of 12 players on each team and is all about team golf. 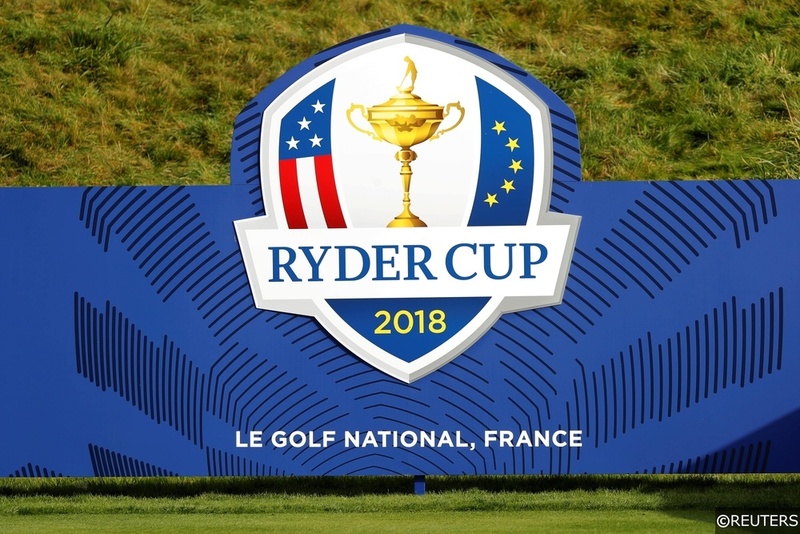 28 matches are played over three days of competition in different formats of match play golf and the whoever reaches 14 and 1/2 points first wins the Ryder Cup. Four-balls match play – 2 vs 2 on each team. Each player plays his own ball. Each team counts the lowest score on each hole and the lowest score wins the hole, if the scores are tied the hole is halved. Foursomes – 2 vs 2 on each team. Each team has one ball taking alternate shots. One player tees off on odd-numbered holes and the other tees off on even-numbered holes. The lowest score on each hole wins the hole, if the scores are tied the hole is halved. Day Three – 12 singles matches. 1 vs 1. The player with lowest score on each hole wins the hole, if the scores are tied the hole is halved. Superior leadership, home support and course knowledge could be the key factors in Europe upsetting the odds in the 2018 Ryder Cup. Thomas Bjorn is a no-nonsense leader and his captains provide a wealth of course experience and knowledge including two-time French Open champion Graeme McDowell. The European team have all competed at Le Golf National including the two previous course winners of the event – Alex Noren and Tommy Fleetwood. Seven of them played in the 2018 French Open, three of them finishing in the top eight. The Americans have have a better average World ranking, averaging 11.15 compared to Europe’s 19.08. However the team with the best world-ranking average has won just three of the last 11 Ryder Cups. Big names and egos tend not to perform well in a team environment. Justin Thomas is the only American who bothered to play in the French Open this year finishing a respectable 8th place. Brooks Koepka missed the cut on his only course visit and Bubba Watson missed the cut by four shots in 2011 before slating the tournament saying how desperate he was to go home. You shouldn’t be put off backing the 13/10 outsiders, just five of the last 12 Ryder Cup favourites have ended up winning. It’s also been 25 years since America last won a Ryder cup away from US soil. Sergio has finished 12th, 8th and 7th in his last three events in Europe. The eight place finish came at Le Golf National on the same course that he will face America this weekend. The Ryder Cup legend looks like he will be a key component for the home side. Sergio has experience having played in eight previous Ryder Cups. and he usually thrives on the buzz of the tournament having won 22.5 points from 37 matches. Garcia won the Masters last year, is a 14-time winner on the European tour, 9-time winner on the PGA Tour, 6-time Asian tour winner and is a former world number two. He’ll likely pair up with fellow Spaniard Jon Rahm in the opening fourballs and they’ll look to mimic the most successful combination Europe have ever had – Seve Ballesteros and Jose Maria Olazabal. The Ryder Cup veteran is likely to see lots of action this weekend and at 12/1 he’s worth an each way play. Spieth is winless since last year’s Open Championship but he has posted five top-three finishes since. He relishes big tournaments when the pressure cooker is fully firing, 3rd in the Masters, 9th at the Open and 12th in the US PGA are all solid major efforts. He’s likely to get top-class playing partners throughout the tournament in Patrick Reed and Justin Thomas. At 9/1 he looks like the best value play in the American camp with question marks over Dustin Johnson’s putting, Justin Thomas’ wrist injury, Tiger Woods ability to play five rounds with back fitness concerns, Patrick Reed and Brooks Koepka’s recent form. Type of Bet: Tournament Preview. Sports: Golf.